They're different, they're eye catching and you're sure to have a trail side conversation with anyone that you happen to come across when you're running a set of Split Rail Skis. On the market now for close to 8 years, Split Rail skis has yet to break through as mainstream, but anyone that runs them will tell you they couldn't live without them. If you're a rider that gets an uncomfortable feeling when your sled suddenly darts from left to right, or have a hard time keeping it flat and tight when turning in corners then you need a set of Split Rail skis. They will make you go from zero to hero in as much time as it takes to install them. We've often said, power means nothing without control and installing a set of Split Rail Skis really does an excellent job of getting everything out of your sled and truly elevating your riding capabilities. 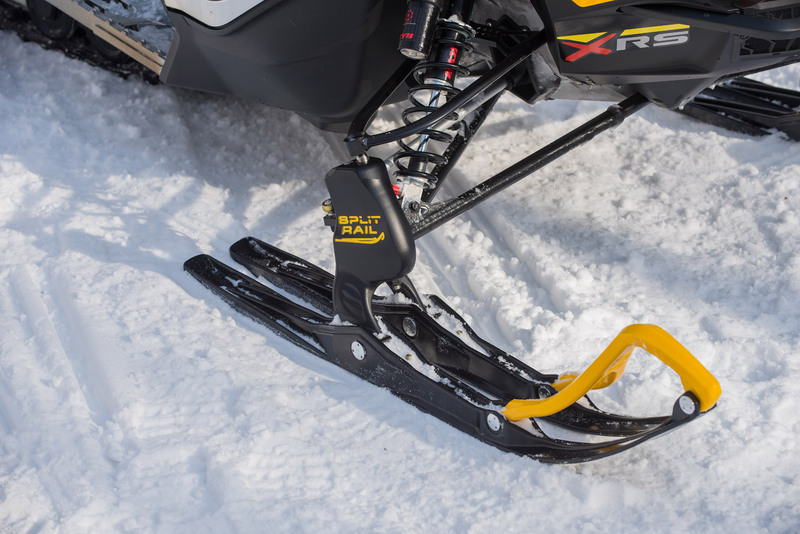 Built around the concept of dual axis' Split Rail skis flex independently to maintain constant contact with the changes in snow surfaces for precise steering control. They eliminate darting due to the fact that the spaced out rails and carbides can never be caught in the same groove at the same time. One of the other spill over benefits to Split Rails skis is the turned up ski ends that shoot snow behind to your track thereby improving slide rail lubrication.